For most students the semester is winding down, but for three of the fashion department’s top students, the work is just beginning. 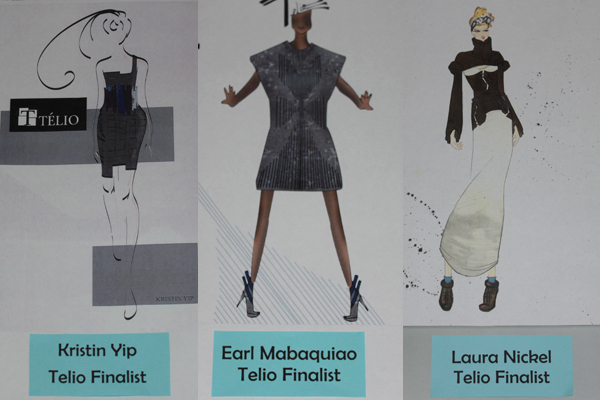 Earl Mabaquiao, Kristin Yip and Laura Nickel have been named three of 25 finalists in the 2001 Télio Design Competition. They now have just five days, once their schoolwork is done, to complete a garment they designed for the competition, which will be held in February. The competition, put on be Montreal-based textile company Télio, invites fashion students from across Canada to design and, now that they have been named finalists, create a garment, which will be presented to judges during Montreal Fashion Week. “Part of the thing that’s also stressful about the competition is that we’re students, and part of the competition rules is that we can’t ask for help from anyone else, so we have to figure everything out on our own. We’ve all done these crazy designs, not thinking that were actually going to get in and now we have to make it on our own,” said Nickel. But the trio is excited to showcase what they can do. “It’s a pretty big deal for us, especially as students. It’s a great opportunity. I think one of the best opportunities as a student in Canada, to show at this event, because it’s a national competition and we have so many opportunities in winning the competition. Also, just in being place in those sort of circumstances, getting to talk with media, getting to talk with industry professionals, doing that networking, making those connections, and then also it’s a super-fun opportunity for most of us who don’t have the opportunity to travel, to have someone put us up in Montreal. Fly us out there and put us up and wine us and dine us. It’s really fun,” said Nickel. Following the Montreal Fashion Week, Télio will announce five winners of scholarships totaling $10,000. The will be awarded based on the student’s ability to show creativity, use technical skills and capture the theme of the competition: Great Canadian North. “I was inspired by the Aurora Borealis and its beauty. I wanted to take that beauty and take a still picture of it in the form of a garment,” said Yip. Mabaquiao drew his inspiration for the weather of the north, while Nickel’s inspiration for her design came from the imperfections found in the north. “There’s all these cracks and crevices and there’s such a rawness about it… These are the things we find so beautiful about the north,” said Nickel. With the semester wrapping up and the university closing for winter break, the three finalist don’t have much time to complete their intricate designs before the competition. Because the fashion week and competition have been pushed up a month, the trio won’t have much time in the new year to complete their work. “We don’t want to leave it ’til January,” said Yip. Although the stress is clearly beginning to mount for them, with schoolwork to take care of before the start their garment, they have not lost their enthusiasm. “At the end of the day, we are showing at Montreal Fashion Week, and to do that as students and someone else is giving us that opportunity, it’s great. It’s exciting but we just have to deliver because our names are attached to it,” said Mabaquiao.